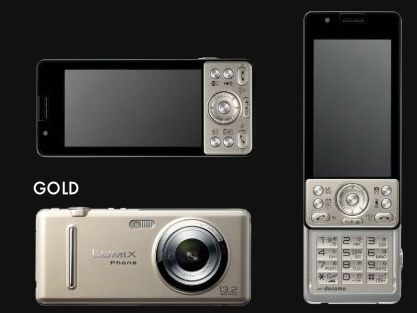 This gorgeous machine, readers, is a 13.2 megapixel camera phone produced by Lumix. It was debuted on the 5th of October, just two days ago, in Japan. Unfortunately, for now it will only be available in the Japanese market. From the backside it appears to be like many other slide phones currently available on the market, but flip it over and it looks like a point and shoot digital camera. The lens is fixed at 27mm (nice and wide) and there is no optical zoom, only digital, so the rings around the lens are a bit misleading. It’s design feature that adds to its appearance. It also has a fairly powerful flash. My point and shoot digital is a four year old Lumix that I bought brand new. It is close to being the perfect point and shoot digital. I absolutely love it. If this phone hits the markets in America I would seriously consider buying it especially if it uses an app friendly browser. I’m wondering what kind of damage this could do to RIM and Apple. You can find the website here, but be warned it is in Japanese. This entry was posted on 7 October 2010 at 7:20 pm and is filed under Photography. You can follow any responses to this entry through the RSS 2.0 feed.